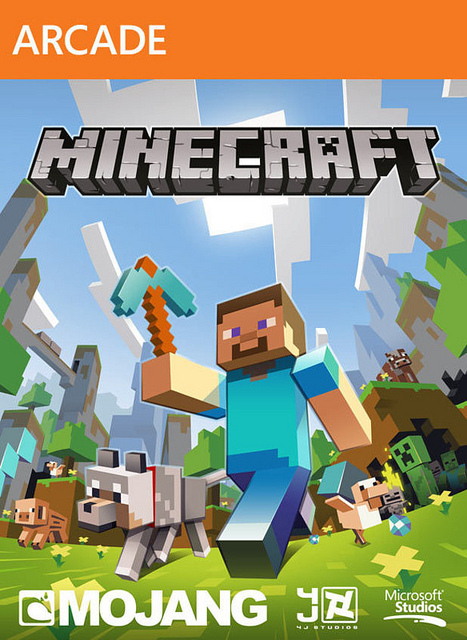 Minecraft, originally only available on the PC, has made it’s way to the Xbox Live Marketplace as an Arcade game. The game is a 2D pixelated style, free roam, creator game. You play as a little guy in a world of wonder, able to destroy or create basically anything you want. You can make a house, a pool, even a garden. On the flip side you can destroy everything you come across with a variety of tools and weapons ranging from a pickax and a sword to TNT. You will need to both create and destroy to make the game worthwhile though, because at night all the enemies surface and are bent on taking you out of the picture. You will need to break down stone, trees, and even dirt to make a shelter for yourself at night. During the day you are free to do as you please, though. In Mincraft you can kill animals to gain useful items such as leather from cows or pock chops from pigs. The leather can be used to create armor for your character so he is not hurt as easily by the enemies. The pork chops can be cooked (or not cooked) and eaten to gain health. It doesn’t end there, there is a plethora of things you can do in this game and many things to find and make. This version of the game offers the ability to play with friends. You can create your own world and invite friends, or join another friends world. You and your friends can work together or play against each other, creating your own bases and trying to sabotage the other players bases. I have only encountered a few issues when playing this game. One is the lag, if you are in a persons world and they have a bad connection to Xbox Live you may have a problem staying connected to the game. Another is a minor amount of glitches. I’ve noticed an glitch which puts blocks of dirt, or whatever it is you are mining, back to where they just fell from causing you to mine them over again. It’s nothing major, but just something to be aware of. Other than that, I have to say this is one of the more consuming games I have ever played, causing me to waste hours of time to simply create a garden for my house, but it’s all very fun and very worthwhile. The lack of issues and addition of co-op makes this a very enjoyable game to play, alone or with friends. I give this game a 9.5 for fun factor, lack of major technical problems, and co-op availability. I would recommend this game to anyone who wants to relax and have a fun gaming experience. Great to know! I saw that this was available in the Arcade the last time I booted up my xbox. I’d been thinking of getting it on my PC, but as I’m more comfortable gaming on consoles, I may go that route to get the Minecraft experience.